The U.S. market for pharmaceutical plastic bottles derives much of its growth by addressing the growing sustainability concerns by increasing the recycling rate of plastics and lowering the environmental impact in the pharmaceutical industry. The advancements in the technology has emerged as the key growth driver of this market. Apart from this, the rising application of plastic bottles in solid and liquid oral medications is also adding to the market’s growth significantly. In addition to this, the growing popularity of plastic bottle, owing to the convenience, safety, and security they offer, is likely to fuel the demand for pharmaceutical plastic bottles in the U.S., leading to a phenomenal rise in this market over the next few years. However, the eco-friendly substitutes for PE and PET, such as glass, metal, and sugarcane, which is also a renewable material, may limit this demand to some extent and hamper the growth of the U.S. pharmaceutical plastics bottles market in the years to come. 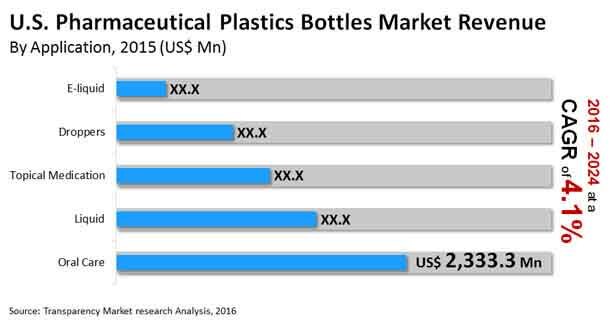 The U.S. market for pharmaceutical plastics bottles presented an opportunity worth US$6.74 bn in 2016. Analysts expect it to progress at a CAGR of 4.10% between 2016 and 2024 and reach a value of US$9.28 bn by the end of 2024. Packer bottles, liquid bottles, dropper bottles, and various other types of bottles, such as Boston round bottle and bullet are the key products available in the U.S. pharmaceutical plastic bottles market. The packer bottles segment is leading the overall market with a share of nearly 50% and is expected to retain its dominance over the next few years due to the rising demand for customized pharmaceutical plastic packer bottles. Liquid bottles, however, is likely to witness a huge leap in demand in the near future, thanks to the retention of drugs content. E-liquid, liquid, oral care, droppers, and topical medication are the prime application areas of pharmaceutical plastic bottles in the U.S. These bottles are likely to find a higher usage in oral care and topical medications than other application areas over the next few years. Pharmaceutical Companies to Continue to Lead Pharmaceutical Plastic Bottles Consumption in U.S.
Pharmaceutical companies, chemical companies, pharmaceutical packaging companies, healthcare centers, and compounding pharmacies are the main end users of pharmaceutical plastic bottles in the U.S. Among these, the demand from pharmaceutical companies is much higher than other end users. Analysts expect this scenario to remain so, thanks to the expansion of healthcare industry and the rising uptake of plastic material for packaging. The healthcare centers are also projected to experience an increase in the demand for pharmaceutical plastic bottles in the near future. The U.S. market for pharmaceutical plastics bottles exhibits a highly fragmented and a competitive landscape. At the forefront of this market are Gerresheimer AG, AptarGroup Inc., Berry Plastics Group Inc., Amcor Ltd., Alpha Packaging, COMAR LLC, Drug Plastics, O. Berk Co. LLC, Pretium Packaging Corp., and Tim Plastics Inc. This report provides forecast and analysis of the U.S. pharmaceutical plastics bottles market. The study provides historic data of 2015 along with forecast from 2016 to 2024 based on volume (Mn units) and revenue (US$ Mn). It includes drivers, restraints and the ongoing trend of the pharmaceutical plastics bottles market along with their impact on demand during the forecast period. The report also comprises the study of opportunities available in the U.S. market for pharmaceutical plastics bottles. It includes value chain analysis with list of raw material manufacturers, plastic bottles manufacturers, packaging manufacturers, suppliers, distributors and end users in the value chain. In order to provide the users of this report with comprehensive view of market, we have included detailed competitiveness analysis and company players. The competitive dashboard provides detailed comparison of pharmaceutical plastics bottles manufacturers on parameters such as company’s revenue, unique selling propositions and key strategic developments. The study encompasses market attractiveness analysis, by bottle type, application, material type, color type, size/capacity, closure type, and end user. Market statistics have been estimated based on average consumption and weighted average pricing of pharmaceutical plastics bottles and the revenue is derived through regional pricing trends. Market size and forecast for each segment have been provided in the context of the U.S. markets. The pharmaceutical plastics bottles market has been analyzed based on expected demand. Prices considered for the calculation of revenue are average regional prices obtained through primary quotes from numerous pharmaceutical plastics bottles manufacturers, suppliers, and distributors. All key end users have been considered and potential applications have been estimated on the basis of secondary sources and feedback from primary respondents. Regional demand patterns have been considered while estimating the market for various end users of pharmaceutical plastics bottles in the U.S. Top-down approach has been used to estimate the U.S. pharmaceutical plastics bottles market. Market numbers for the U.S. bottle type, application, material type, color type, size/capacity, closure type, and end user segments have been derived using the bottom-up approach, which is cumulative of region’s demand. The market has been forecast based on constant currency rates. A number of primary and secondary sources were consulted during the course of the study. Secondary sources include Factiva, World Bank, Packaging Digest, Plastic Manufacturers Association, Society of the Plastics Industry, and Hoover’s, and company annual reports and publications. The report provides detailed competitive outlook including company profiles of key participants operating in the U.S. market. Key players in the U.S. bottle type, application, material type, color type, size/capacity, closure type, and end user market include, Gerresheimer AG, AptarGroup, Inc., Berry Plastics Group, Inc., Amcor Limited, Alpha Packaging, COMAR, LLC, Drug Plastics, O.Berk Company, LLC, Pretium Packaging Corporation, and Tim Plastics, Inc.